QOTW2- What are you and your family doing for the 4th? AOTW2- If dh gets a mileage pass, we'll be going to visit some family.. If not, we have to stay w/i 50 miles of the base, so I'm not sure what we'd do. Maybe just watch the fireworks on t.v. Amy - I'm sorry your Dh may be leaving sooner. I am such a planner so the 24 hr notice thing would not sit well with me either! Jennifer - What a cutie pie. All of our little ones are growing so fast. I don't remember Kaitlyn's "babyhood" flying by this quickly. Ryan already has 2 teeth for goodness sakes! Sorry I have been so absent. This will be quick, but I'll try to come back soon. I'm STILL searching for a job. My back has just started to heal enough where I can actually envision working. I (knock on wood) have only had minimal pain for the past few days and have only taken meds a few times. A dear friend from Syracuse decided that she would meet me at JFK to help me make a trip to Orlando to visit my nephew (who is 5 weeks older than Kannon) and niece who will be 5 next week. We went down 2 weeks ago and had a great time. Two of my sisters and my aunt & uncle live there. It was an emotional trip, though. I lost Dashiell in the hospital where my sister is a labor and delivery nurse. The last time I was in Orlando was to collect Dashiell's ashes. I cried several times, especially when my sis got called in to work and I had to drop her off at the hospital. Other than that, it was wonderful. The link below has some pictures. Kannon is the blondie. AMY - I'm thinking of you and keeping you, your dh and boys in my thoughts and prayers as he gets ready to deploy. I've got to run. (have to get to physical therapy). I'll be back later to catch up with personals. I think of you and your los often!!! Tif- I hope we get the mileage pass too! Allison- I'm so glad to hear from you! We've missed you around here. Happy to read that your back is feeling better.. Kannon is just beautiful. I love the pic w/him in a hat. Too cute! Hi Allison! So good to hear from you. I'm glad your back is beginning to heal. I hope you find an amazing job soon. Thanks for sharing the pics. They are adorable and it looks like everyone was having so much fun. I love the little superman shirts! I hope you all had a nice 4th of July. Ours was nice & relaxing. We finally got a storage space in the building after being on the waiting list for 2 years. We spent the weekend moving stuff out of the off site storage unit into our building. It's so nice to be able to put his car seat somewhere accessible, but not in our one room apartment. The best part is that Kannon has a new room - a closet! You gotta love living in Manhattan. I'll post a pic below. The best part of our 4th was that we could see the Macy's fireworks from our bed. They moved them to the west side this year and we had a great view. AMY - Did dh get the leave approved? If so, what did you do? I think of you so often. I can't imagine having more than one child to take care of, let alone a toddler and twins. You are one amazing chick! TIFFANY - So good to hear from you, too. Thanks for the well wishes. Any more word on possibly moving to Tuscon? I think the SW is so beautiful. IT seems so foreign to me, being a New York State gal my entire life. I need to see photos of all of the December babies! Please post them when you get a chance. I'll post a photo of Kannon's room later he's calling now! Allison - Too funny about Kannon's room being a closet! I have been an AZ girl my entire life, so Manhattan seems just as foreign to me as the SW seems to you! Tiffany - Cute picture! Ryan is getting so big. Allison - It is great to hear from you. I enjoyed your vacation pics and look forward to more pictures of Kannon and his new room. Amy - I hope the reason you haven't been on lately is because you and dh are spending time together. I hope you were able to travel for the 4th. We had a bbq in our backyard with my mil and her 5 foster kids. We put up the waterslide and the kids had a great time. Kate now has 2 teeth and is getting up on all fours but not crawling yet. She started saying Da-da-da over the weekend and today I think I heard her say Ma-ma-ma. Not sure if she is talking about us yet. Luke is trying to get her to say "big brother". 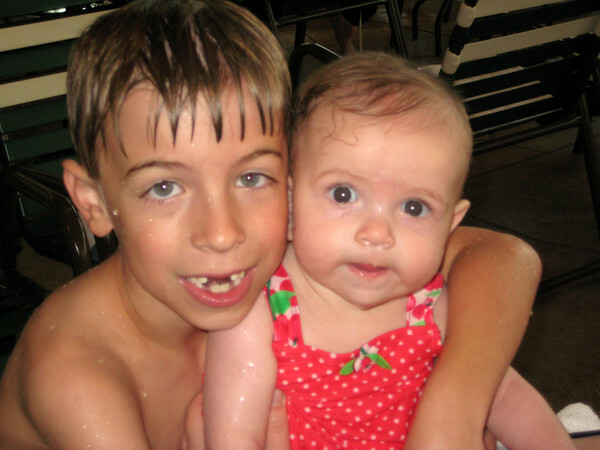 Here is a picture of them from our Great Wolf Lodge vacation in June. Kathy - Cute pic! I love little baby swimming suits. Kaitlyn was just telling Ryan the other day, "Say Kaitlyn!" Robert left yesterday. I told Matthew that he needed to go, and he said, "Daddy no go!" It was just hard to hear him say that. I'm not really up for posting right now. I'll try when I can see straight. Oh Amy - Huge hugs for you. I'm sorry DH had to leave. It must be really difficult for you on so many levels. I am here if you need someone to vent/talk to. Amy - I'm here too. I wish there was something we could do or say to make it easier for you. We are praying for you and your family. I'm so glad you were able to get the pass to go see family for the 4th. I pray that the months speed by and Robert is safely home before you know it. Thanks, ladies. I'm doing better today. I even made a slideshow for you guys! I love your slideshow! The boys are getting so big. I love the pic of all the boys and their drinks. That picture of the army men really made me sad and proud. That day must have been so hard for so many. I admire the military and their families so much. I really don't think I could do it. Kathy- Thanks... The crazy thing about that pic is I could only get part of 1 company at a time, and there was 3 companies there at the time. So many men and women left that day. I hated to see so many families crying. That might've been the worst part. Amy- how often do you and the boys get to talk to Robert? I hope it is a lot. I could use some prayers tomorrow (friday). It is Jake's 3rd angel-versery. I am feeling pretty anxious lately. I plan to keep Kate home with me and will probably go to the cemetary. She is at about the same age Jake was. He was 8 mths 1 wk when he died. Kathy- Praying for you, although I'm a little late. I hope your day was gentle. You are so strong. Btw, Robert and I have been able to talk about every other day, but that's going to change soon to about once a month when he gets to his fob. It's going to be rough. KATHY - Praying that your day yesterday passed peacefully. I hope that Jake made his presence known to you. Kate is just a doll! I'm sure you held her extra close yesterday. TIFFANY - Ryan is such a cutie, too. I think we all had some good looking babies! Can you remind me how to post a pic to the thread? I can't remember! AMY - I loved the slideshow. Your boys are beautiful and seem like three peas in a pod. Like Kathy said, I can't imagine being a military family. I know how hard it is when dh leaves to do a film or show. I can't imagine what you must be going through, especially being a mom. I will keep you & Robert in my prayers every day. Thank you for the prayers - I got through the day I always dread. In fact this was the easiest anniversary I've experienced this far and I felt kind of guilty. If we still had Jake we wouldn't have Kate. As much as I hate having lost Jake I can't imagine not having Kate. I am trying to just remember our happy Jake memories and know that he is in heaven watching over us and wants us to be happy. Allison - I always forget how to post pictures - I'll try it and put some directions. Amy - I'm sorry Robert had such a sucky birthday. I'm glad you get to talk so much now. What is fob? Kathy - Hi! I am so glad Jake's angelversary was more gentle on you than expected. I was praying for you but was just so heartbroken for you I didn't know what to say. I can't imagine how difficult it would be to lose a child around Ryan's age. It just really hit home for me. I hugged him a little tighter that day too. I feel a little guilty sometimes being on the "loss" board because I have only had a miscarriage. Although that was difficult for me, it pales in comparison to the losses some of you have suffered. Allison - I created a free account on www.photobucket.com. 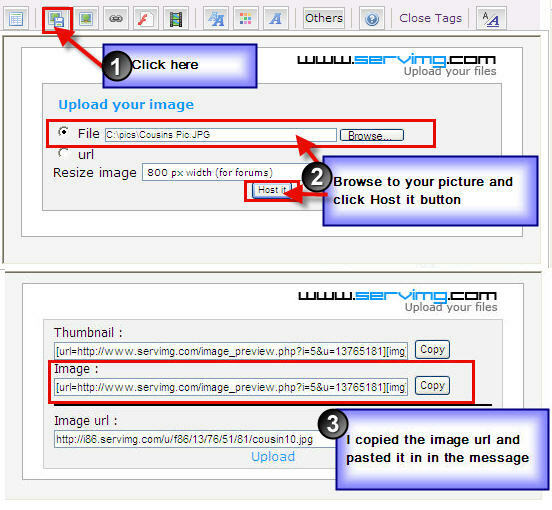 Then I upload my photos there and copy and paste the IMG code into my message on here. Amy - You have every right to have grumpy days! Sorry DH had to spend his bday like that. Although, every day here is hot. It has been between 110-116 everyday for the last month or two. I do not have to work out in the heat though. That really would be miserable! Tiffany - Thank you for your prayers - they helped. It is hard knowing our little ones are the same age now that Jake was. I'd been extra anxious about Kate - but seem to be a little better now. I think after I get past Aug 13 - I'll be much better. That is the day she will be the exact age Jake was when he died. Don't ever feel guilty for being on a loss board -- all losses of babies at any stage is difficult. I'm sorry you are here but also glad because I love getting to know you. I hope you don't have to move - if that is what you want. Has anyone heard from kiwi_piwi from Australia? The last time she was on was Dec 20 and I don't remember reading if she had a boy or girl and if everyone was healthy. I hope so... please let me know if you know anything. TIFFANY - Great idea to post on the December BBC board about a reunion. Honestly, I don't really go there anymore, but maybe some of the other gals do. Kathy is right, you should not feel guilty. We have all had losses. Even though mine was a stillbirth, I don't consider it anywhere near the degree of Kathy's loss, but the bottom line is that we all know what it is to lose a child. The friendships that we have developed are a very positive thing to come out of a very dark experience. AMY - (((HUGS))) I hope you're doing ok. Please check in when you have a chance. You may need to paste it in your browser, rather than click. Tiffany - thanks for the tip about using photobucket - I'll have to try that. And I love the idea about a reunion. I'm just kind of worried about kiwi_piwi - did anyone see a birth story for her on the BBC board? I haven't been over there forever. I've been in touch with hope_of_hevn (Jill) via facebook. She has a beautiful little girl. Allison - I loved the slideshow. Kate has the same two teeth Kannon has. He is so cute.